Greetings, spooks! After a few days of haunted theater, we return to more typical haunts. And today, we have a Westcoaster debut to show you all. From the Warner Bros. 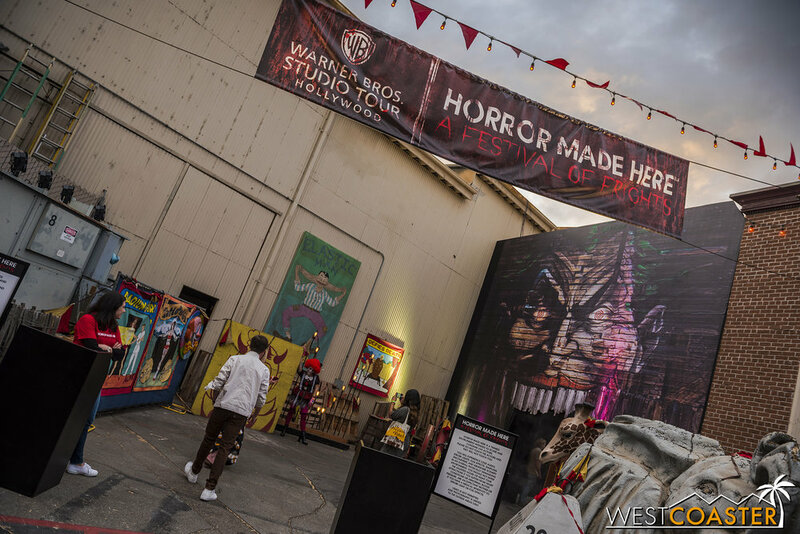 Studio Tour, it’s Horror Made Here: A Festival of Frights! The circus has come to town! 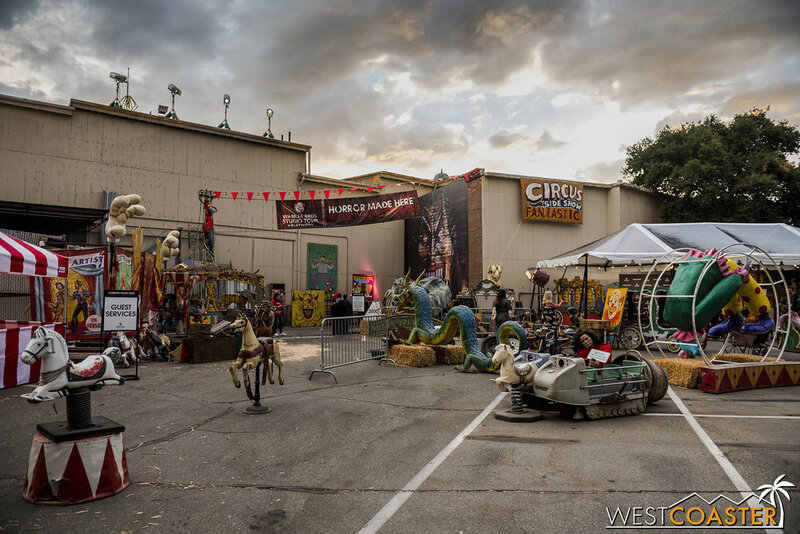 A dark, haunted, twisty circus. 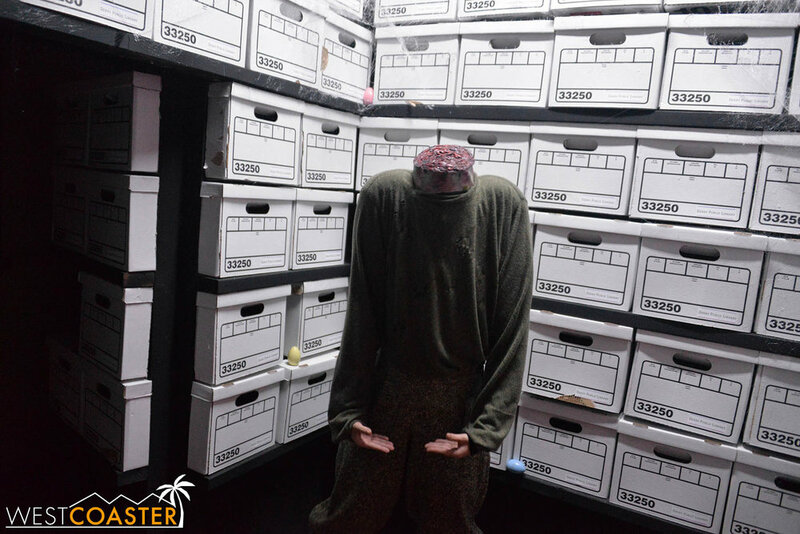 Last week, we had the chance to preview visit the Horror Made Here Halloween festival. 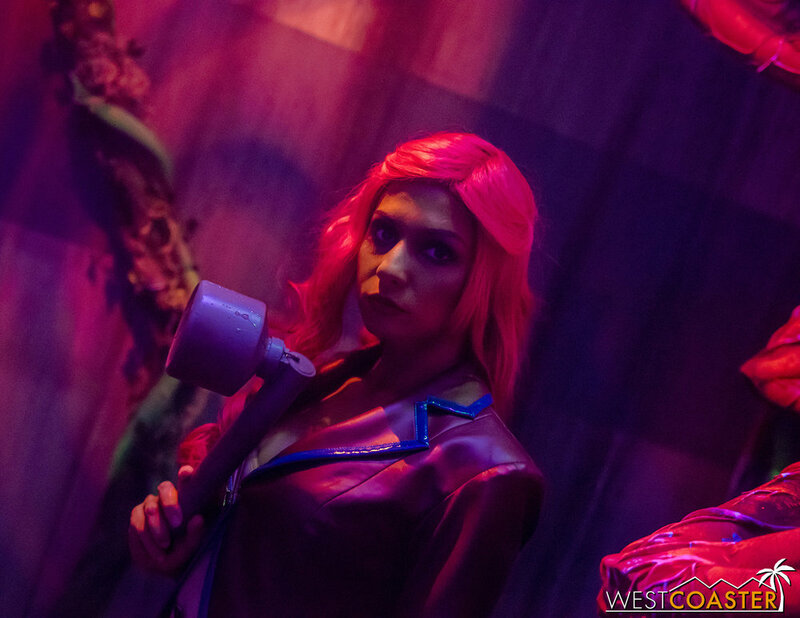 You may have recalled our coverage of the Horror Made Here panel at Midsummer Scream. There, the producers promised a more intimate haunt experience geared toward the more passionate fans of the franchises being featured. No haunted conga lines here (take that, Horror Nights! ), just a high quality experience intended to focus more on the storytelling of the respective IP’s in addition to scares. Well, if that was the intent, mission accomplished! 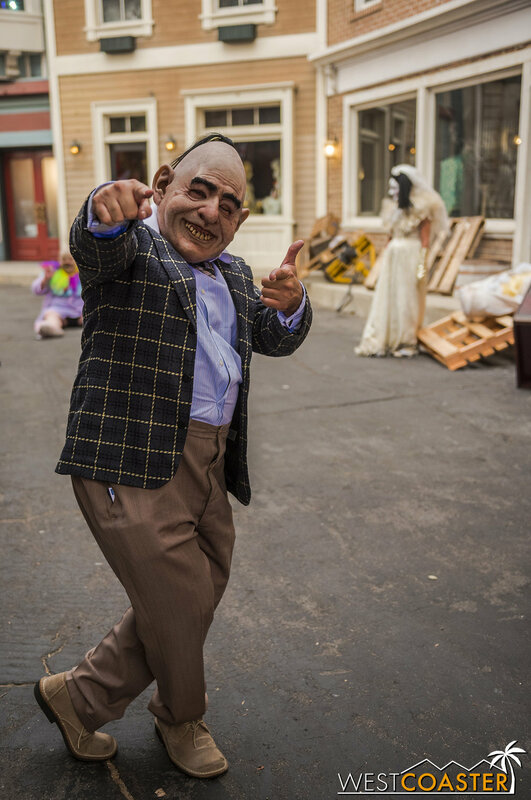 We had a great time during our preview and media night visit of Warner Bros. Studios' actual backlot, taking in the five haunted attractions and additional attractions at this "Festival of Fright." 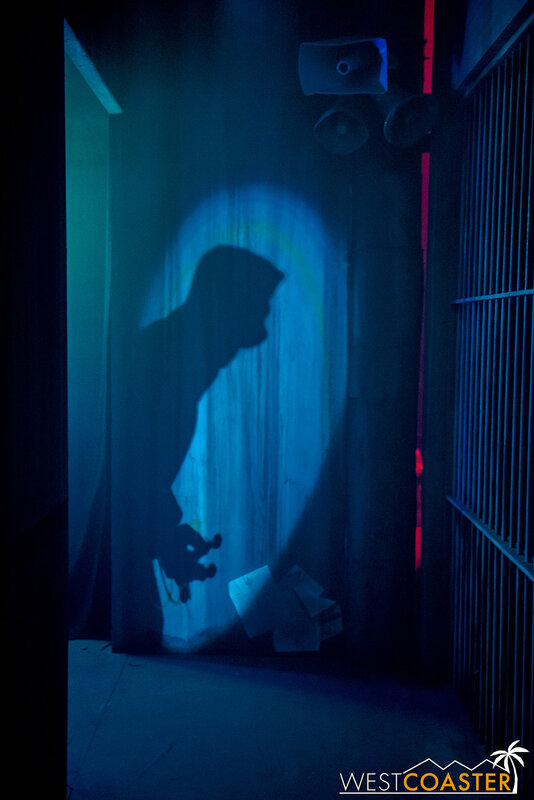 We particularly enjoyed the more unique, story-oriented approach to the mazes, which organically interlaced the scares within the plot of the scene, rather than force a "Boo Box" scare or bring in a prop effect just for the effect of it. There were even a few tricks we hadn't really seen integrated in any haunted maze we had experienced. 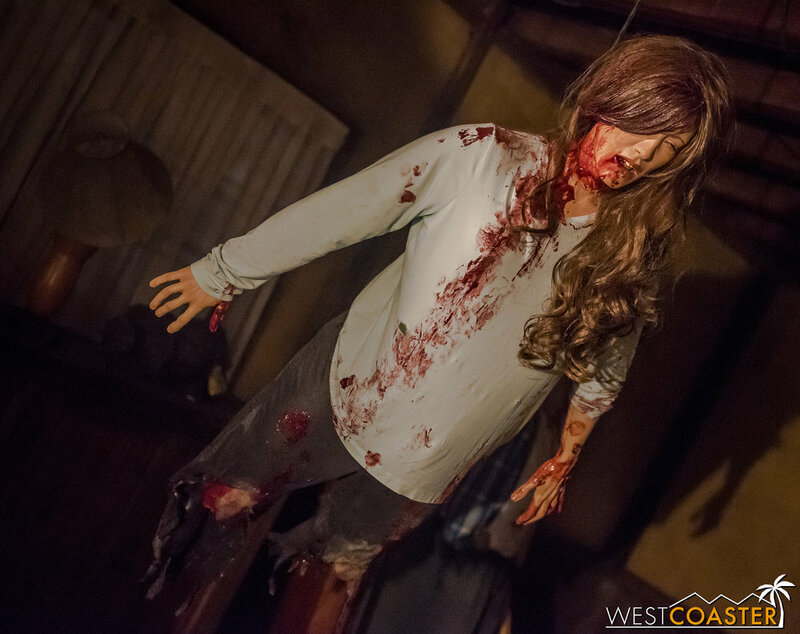 It all added up to a resounding success for Horror Made Here's pivotal year three, which the producers admitted was a milestone point to a more serious engagement of the already saturated Southern California haunted attraction scene. I've long talked about the "Big Four" theme park haunts--Knott's Scary Farm, Universal Studios Halloween Horror Nights, the Queen Mary's Dark Harbor, and Six Flags Magic Mountain's Fright Fest. But give this event a couple more years to stretch its legs, and we may soon be talking about a "Big Five!" The critical reception has been that positive! Lets take a more in-depth look at the event. Photos in this update are by Dan Angona and myself. 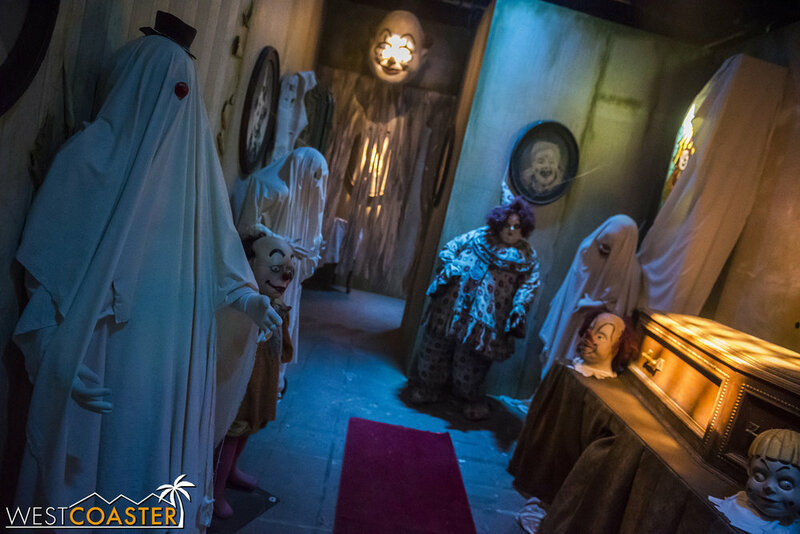 Guests entering Horror Made Here will find a haunted circus overlay organizing the framework of the event. Arrival outside the gates places guests in a field of creepy old amusement fair rides and carnival mannequins, which create a bizarre backdrop and many photo ops. Passing through the mouth of an oversized clown mural brings people into a scare zone of sorts, with carnival freaks and clowns and other oddities. 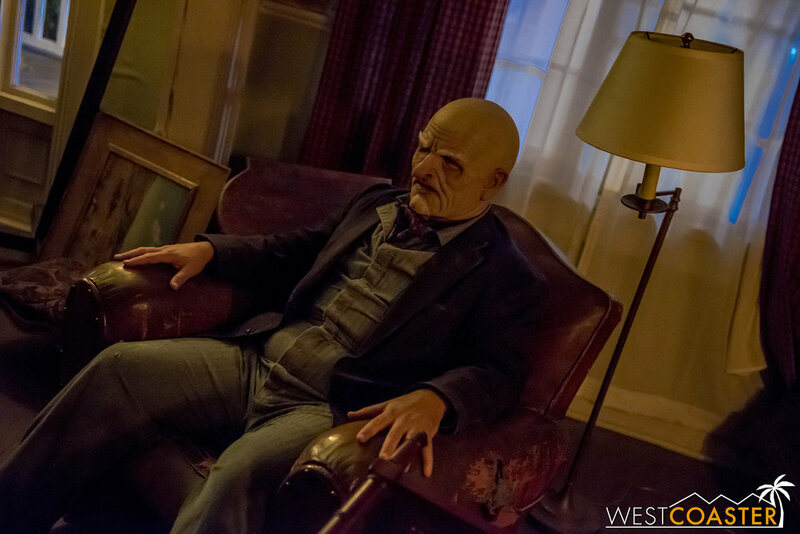 These creeps are both frightful and entertaining at the same time. When they're not terrorizing, they might be mocking people and things or loud-mouthing to catch attention. The event itself is largely organized around the backlot's central quad area, Stars Hollow. 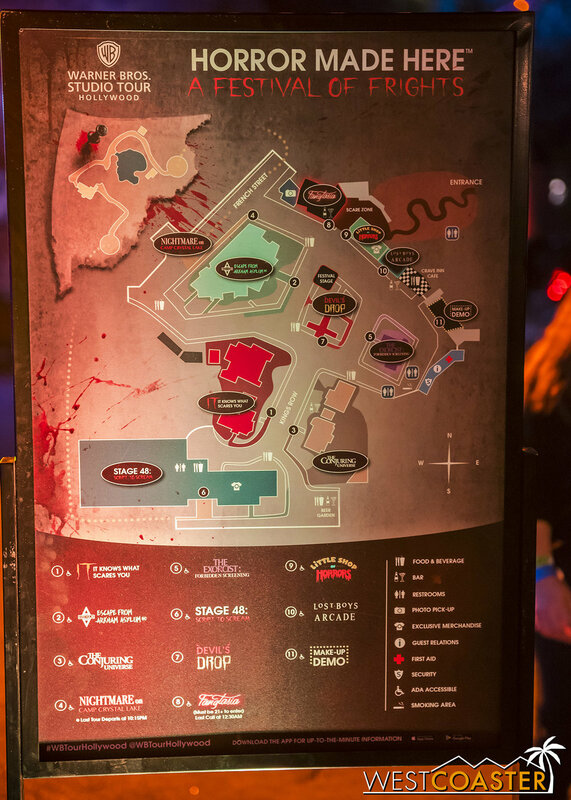 It is the hub from such guests can access the three mazes, the Camp Crystal Lake tram tour and walkthrough experience, and Exorcist Forbidden Screening "4D" movie attraction, plus the other sights and amenities of the event. 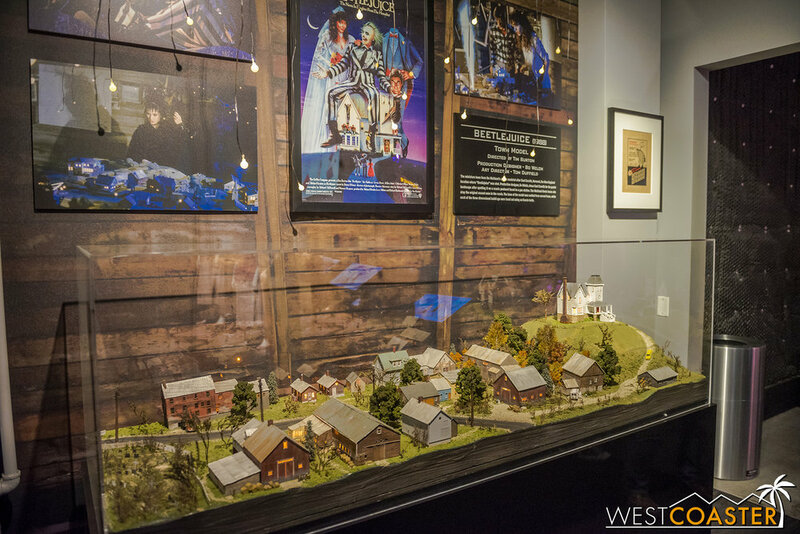 The coziness of the layout reflects the more familial approach that Warner Bros. has taken (though, also, the studio does have less space to spare in general compared to, say, Universal Studios). That said, the fact that it takes only a few minutes to get from the two farthest opposite ended attractions will be a welcome facet of Horror Made Here by those who do not like hiking their haunted events. Meant Porkflesh. He just likes sitting around and being disturbing. Yes, we have one reader named Barbara. A DJ spins music at the center stage in Stars Hollow. 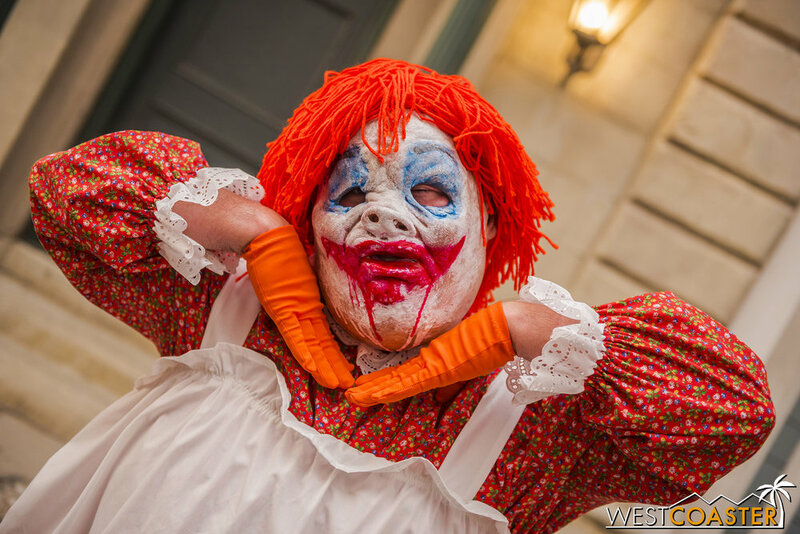 Clowns abound in this Festival of Frights. Some even pretend to be photographers. 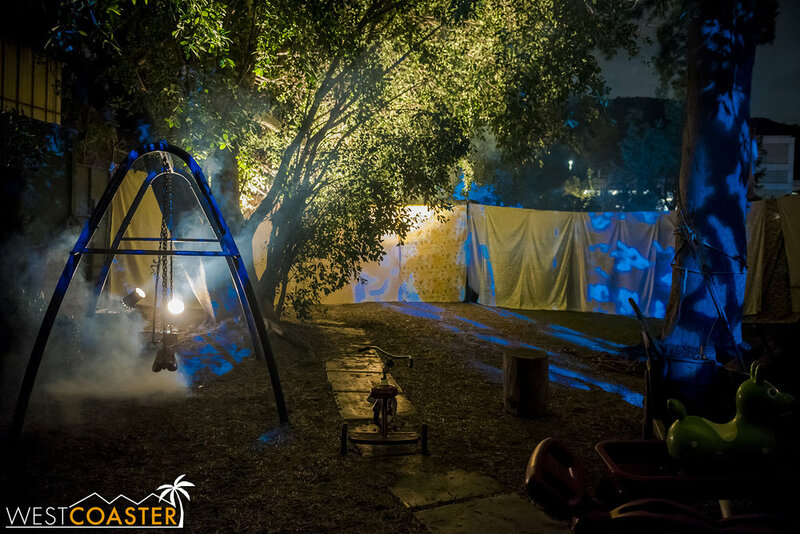 As mentioned earlier, Horror Made Here has three mazes as a part of this year's lineup. 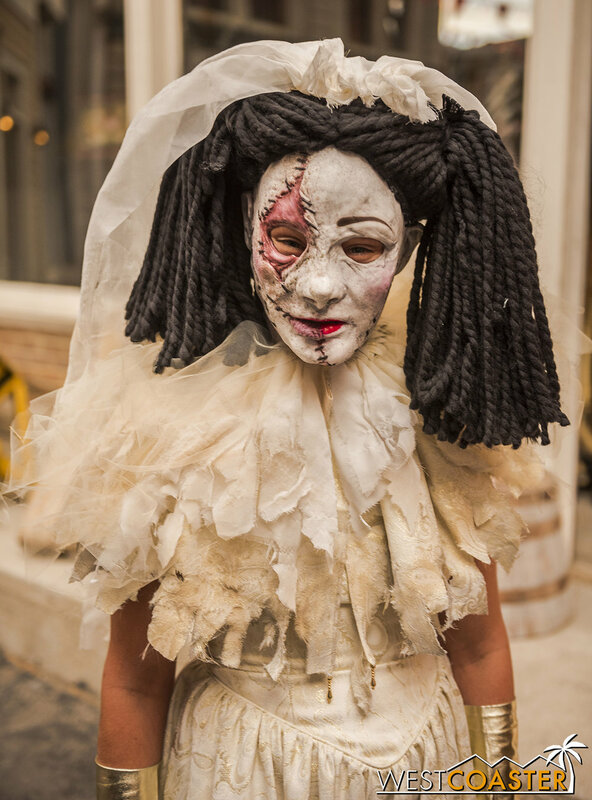 All three provide strong but different types of haunted experiences, playing to different strengths. All of them share a central and consistent pattern of story narration, providing a vet polished cinematic feel to the maze environments and scenes. 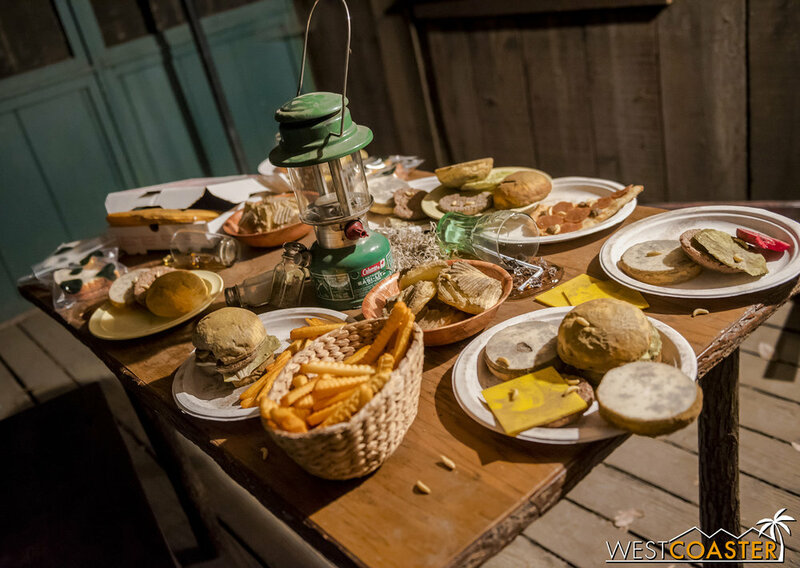 The theming and set dressing are richly beautiful, with layers of details and an exceedingly immersive ambiance. It was fun to just go through and look at everything, because it felt as though each room of each maze feature plenty of see. 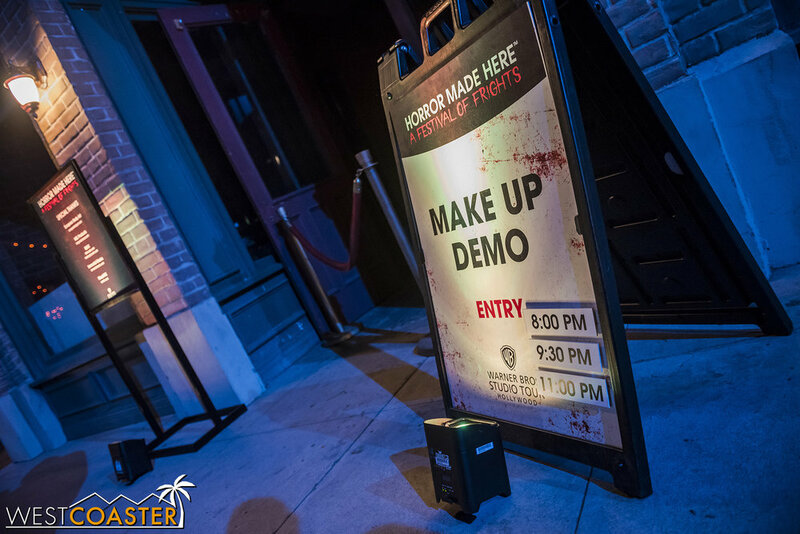 It’s interesting to compare how Warner Bros. has approached their IP-centric mazes with how Universal has done it at Halloween Horror Nights. 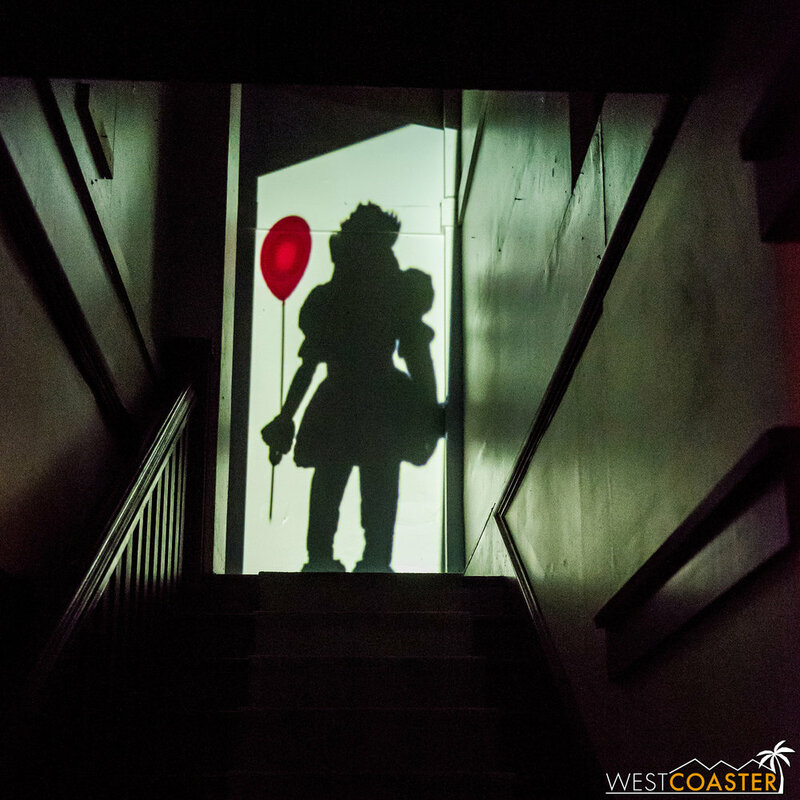 While both attractions strive to create realistic and articulate settings that place guests into the middle of the movies, they take different strategies on the actual scares. 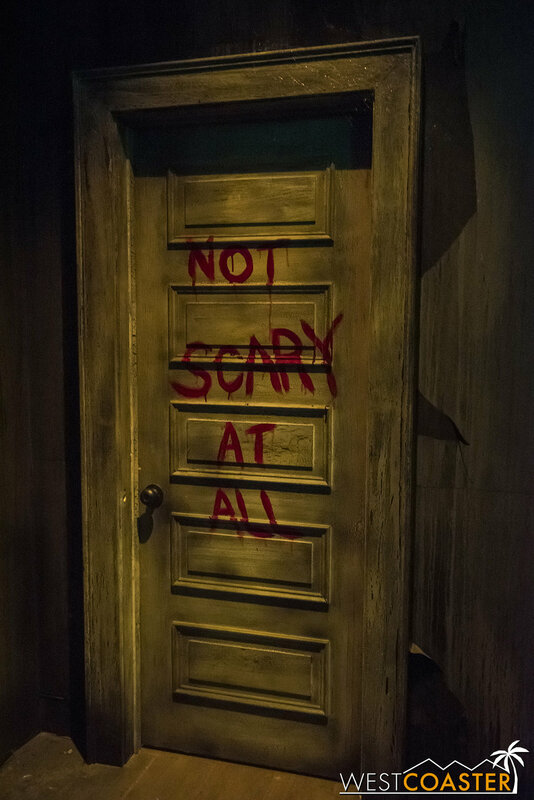 Universal, as I’ve longed commented upon, relies on a tried and true (and some would say stale) formula of “Boo Boxes”—distraction moments that careen into a loud sound effect, strobes, and a scareactor popping out of a hidden room or compartment to jump scare guests. 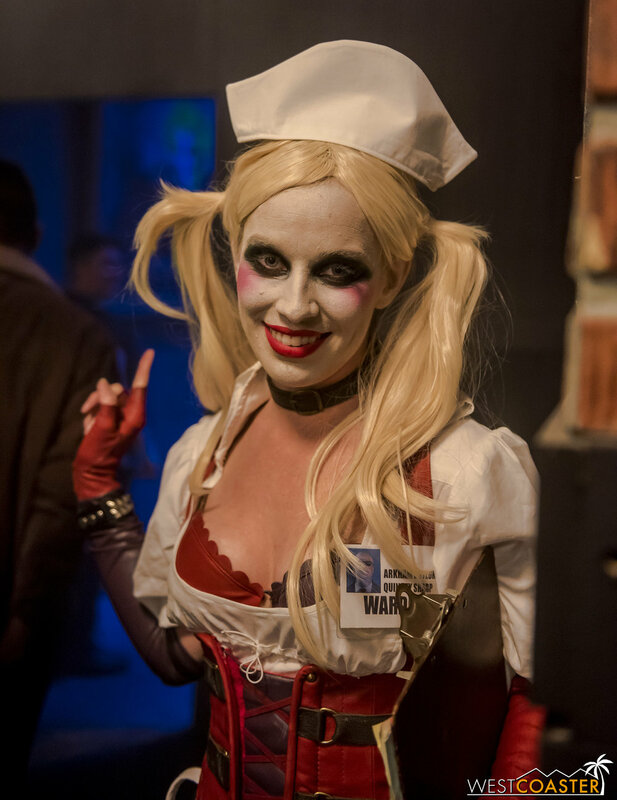 Warner Bros., however, has ramped up the diversity and the creativity of scaring, using a variety of different techniques that focus on bringing a scene to life or work within the constructs of a space. 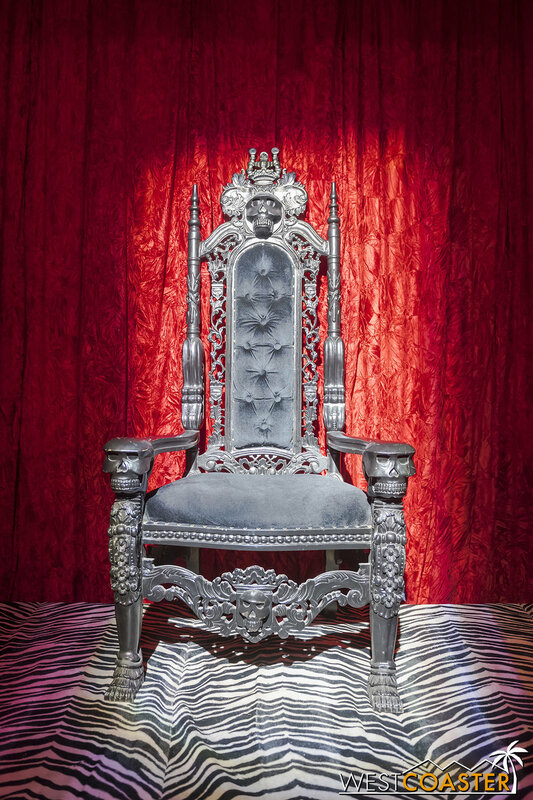 These may involve live actors, props, animatronics, or practical effects. And the result is scares that feel very natural within the flow of the maze and the story. Guests really live the movies the mazes are based upon! On that end, what we saw at Horror Made Here last week already outshines the quality of scares that Universal exhibits, because while Universal is high throttle on the intensity, it’s the same level, and even that becomes predictable and eventually ineffective after a while. 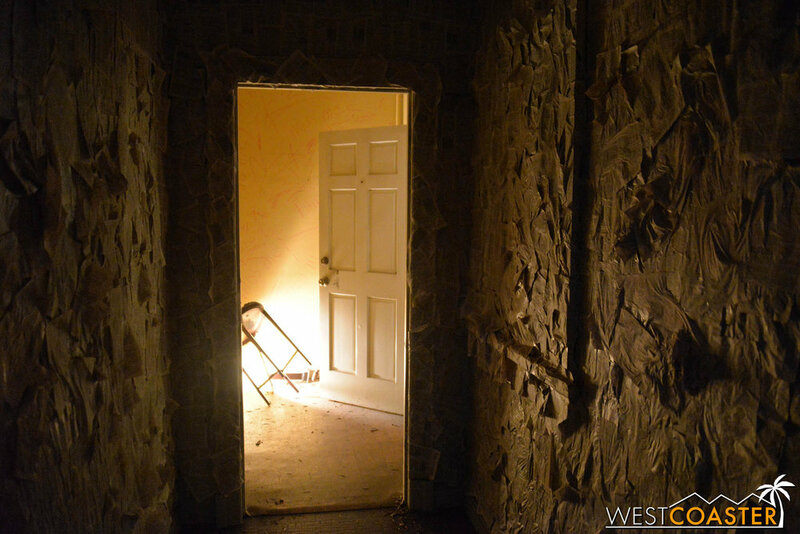 Last year, guests to Horror Made Here were able to experience a trip through the Neibolt House—infamous abode featured in the terrifying tale of It. 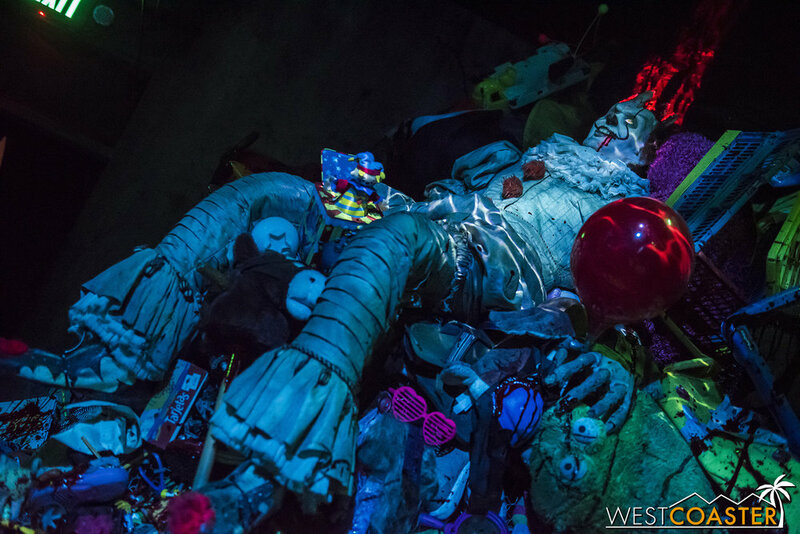 First appearing as a free, pop-up installation in Hollywood that attracted massive lines, this haunted house was more of a walk-through amusement park attraction, relying on animatronics and effects for jump scares than actual actors, and generally creating a creepy vibe around which Pennywise the clown lurked. Watch out for sewers, Georgie!! 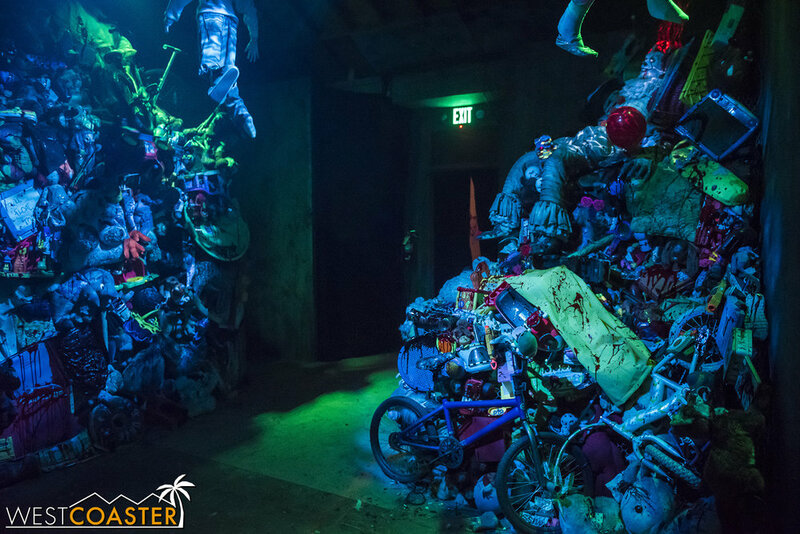 This year, It returns to Horror Made Here, but far from a duplicate of last year’s haunted house, It Knows What Scares You is a fully different, original design that plays much more like a traditional Scary Farm or Horror Nights-style haunted maze. 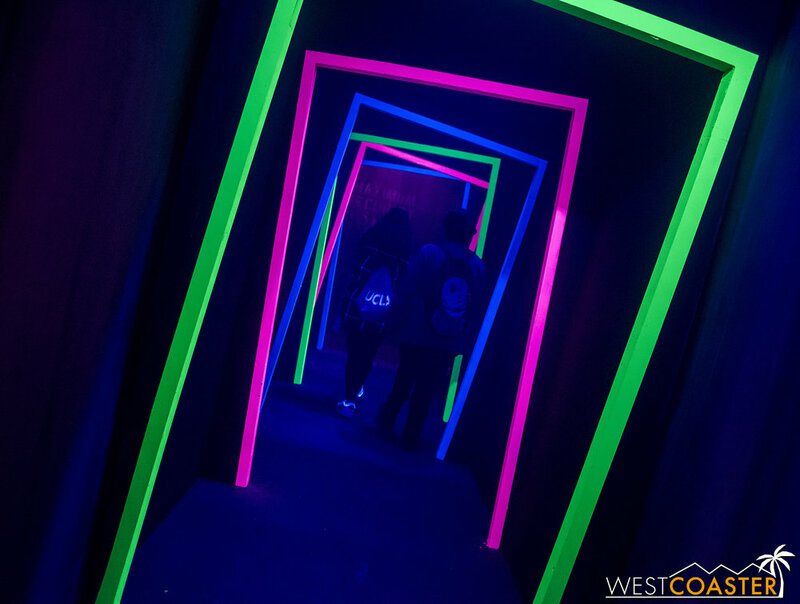 One of two mazes designed by creative firm, Mycotoo (which also did Aftermath 2: Chaos Rising at Magic Mountain’s Fright Fest two years ago and whose chief creative officer, David Wally, is also the talent captain at Queen Mary’s Dark Harbor), this maze once again takes guests through the Neibolt House. As a maze, this ITeration (get It? wow, It just keeps on going…) is stunningly beautiful—a classic elaborate haunted house experience that really places guests into the settings of the movie. 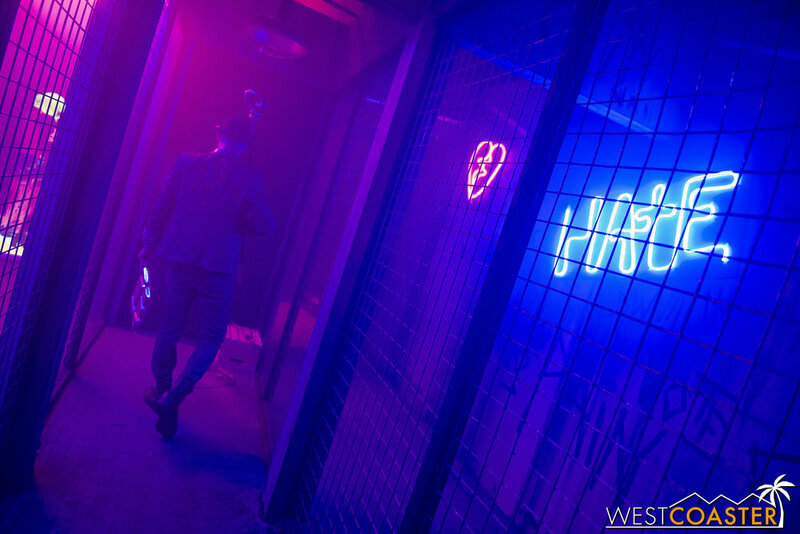 From the moment people enter the house, the soundtrack, lighting, and effects contribute to a tense and suspenseful experience. 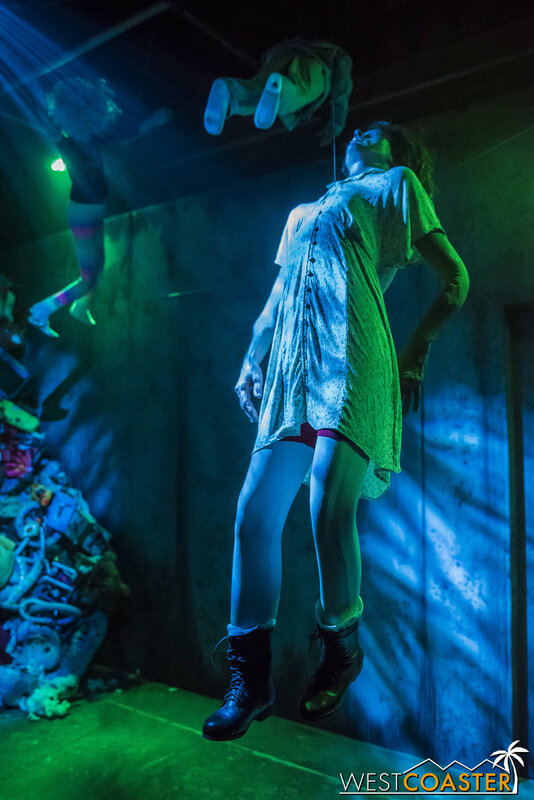 The combination of live actors, projected effects, and traditional prop-based startle gags mixes up a nice bundle of frights. The actors also contribute to the story—each of them a character in some way, some scaring and fulfilling a role, others present to be part of the story but less an active scarer. The mix keeps guests on their feet, making the experience much less predictable than it might otherwise be. Pennywise’s cohorts are pretty demented too. 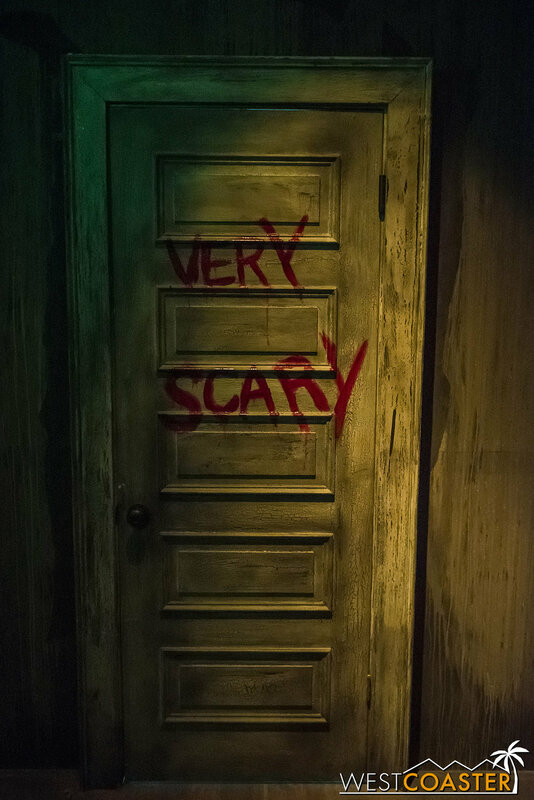 Overall, It Knows What Scares You floated to the top of our maze rankings by providing the best overall package—a stunning set, effective scares, great incorporation of technology, strong story-telling, and a very active cast. Of course, the star gets a stab at guests too. 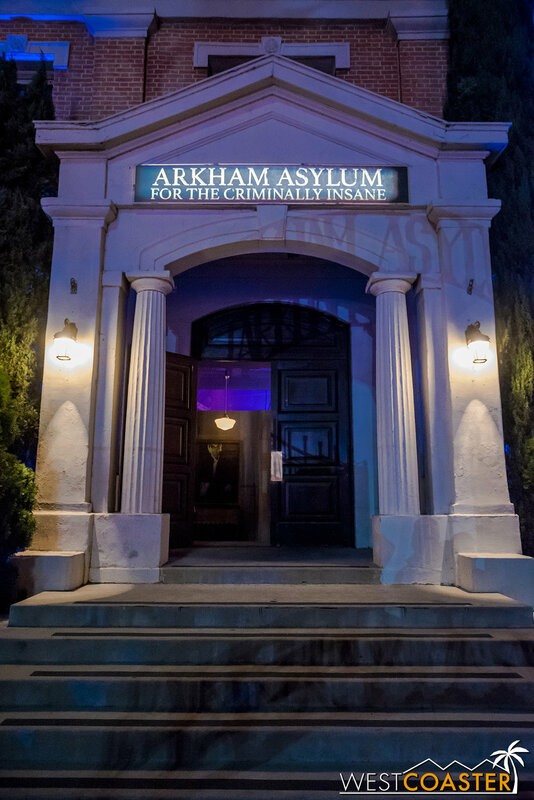 Of the three mazes announced for Horror Made here, the DC-based Escape from Arkham Asylum might have generated the most excitement. 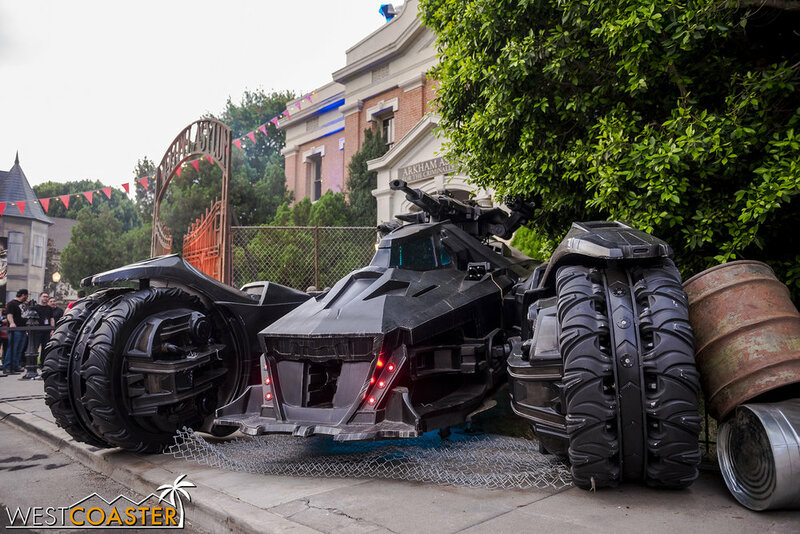 Where else would guests be able to come face to face with the most dastardly villains of Gotham? Certainly not at Fright Fest, which had a Suicide Squad scare zone last year and the year before but not this year. No, when it comes to Joker, Harley Quinn, The Riddler, the Penguin, and company, Warner Bros. Studios would be the hosts this year. Welcome to the most infamous asylum in comics. A familiar warden checks guests in. 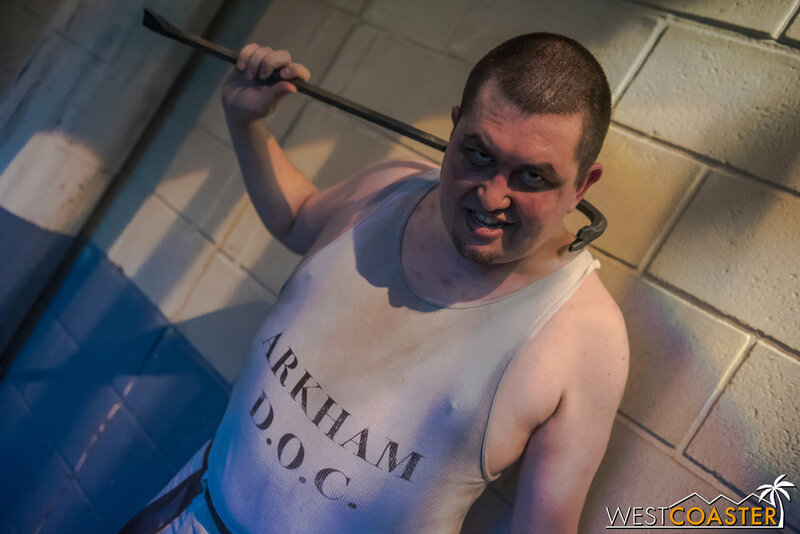 Also designed by Mycotoo, Escape from Arkham Asylum seems to be the most reliant on the actual acting of the cast to operate. This makes sense, because the characters within the maze are mostly highly recognizable names with cultural resonance. And the acting is superb. A flat out Murderer’s Row (literally?) 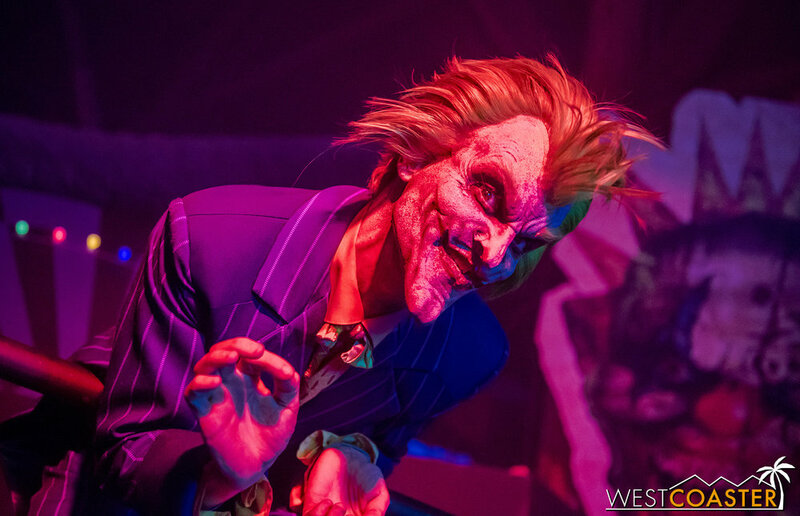 of Batman nemeses is on hand to hound and harass guests, and the actors each bring a wonderful twisted personality to their portrayals. 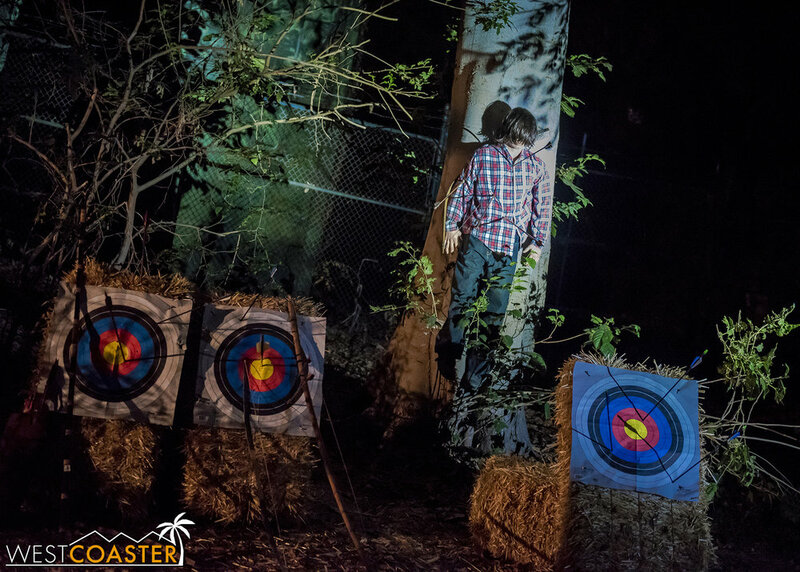 But unlike the other two mazes, the scares seemed to be more lacking. Instead, the attention appears focused on the energy of the talent and story-telling of the scenes. Bad people awake inside Gotham’s correctional institute. There is varying success here. Aesthetically, the maze looks great. Colorful and cartoonish, it really brings the comic book characters and settings to life. Although the breadth of detail is probably less here compared to the other two mazes, the various rooms still provide photogenic sights and effective environments. On the other hand, other than touring Gotham’s most infamous prison, there isn’t really a clear focus or direction for the story of this maze. The experience seems rely on more of a flexing of star power, and we left having enjoyed the maze but feeling like it could have been better. 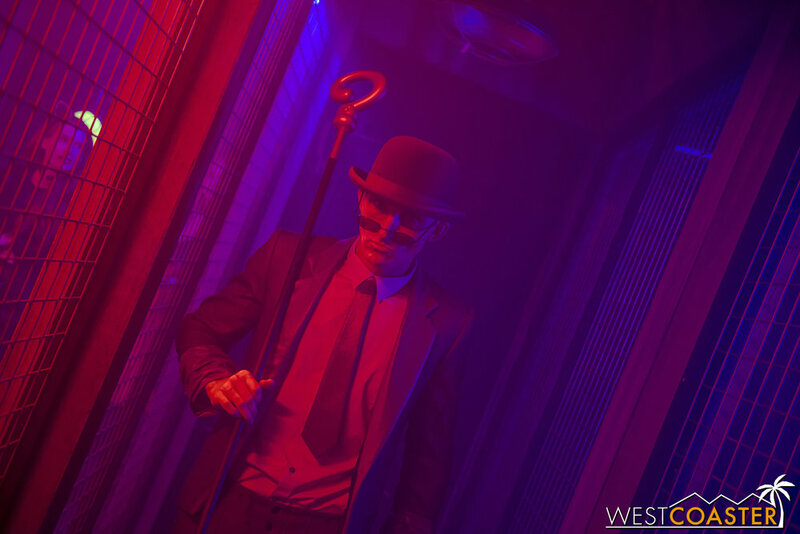 There are little things—like maybe incorporating a rumbling platform in the elevator scene or better explaining the connection between certain decidedly non-jail spaces—a nightclub and a funhouse, for example—and the premise of going through Arkham Asylum. And the ending seems quite abrupt—it was unclear just exactly how the story of the maze might be resolved. The Riddler (left) is among the villains prowling the premises. Of course, you can’t have Batman villains without the Joker. 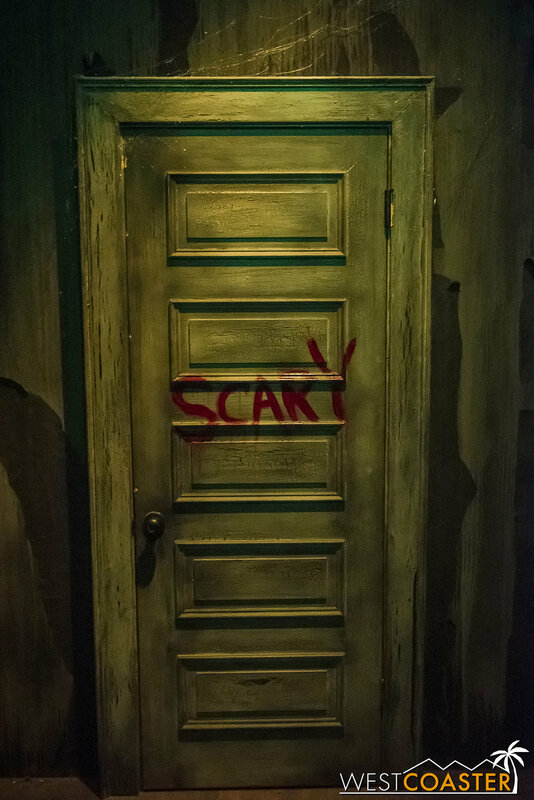 The most unique maze at Horror Made Here is undoubtedly the one dedicated to The Conjuring franchise. Unlike the traditional, free-flowing haunted maze seen at haunts that most Southern Californians are used to, The Conjuring Universe pulses groups through a series of rooms, always accompanying them with one or more actors that served as hosts or guides in each segment. 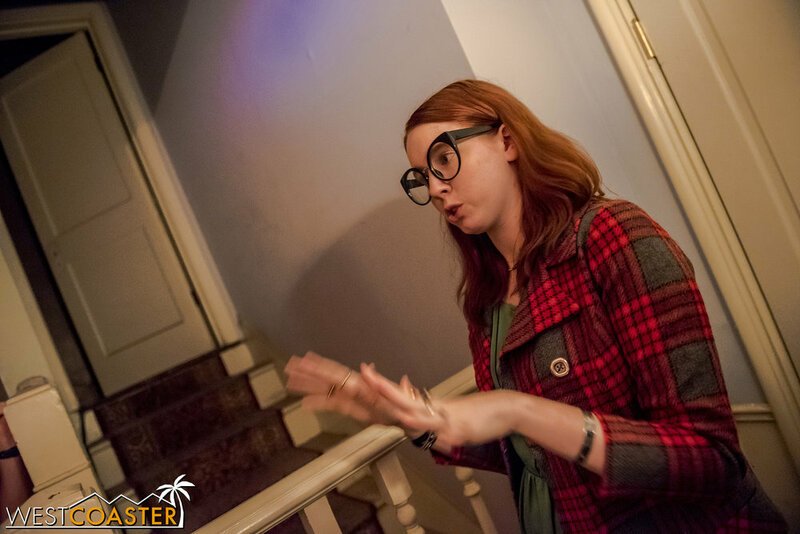 One of our guides through a most haunted house. 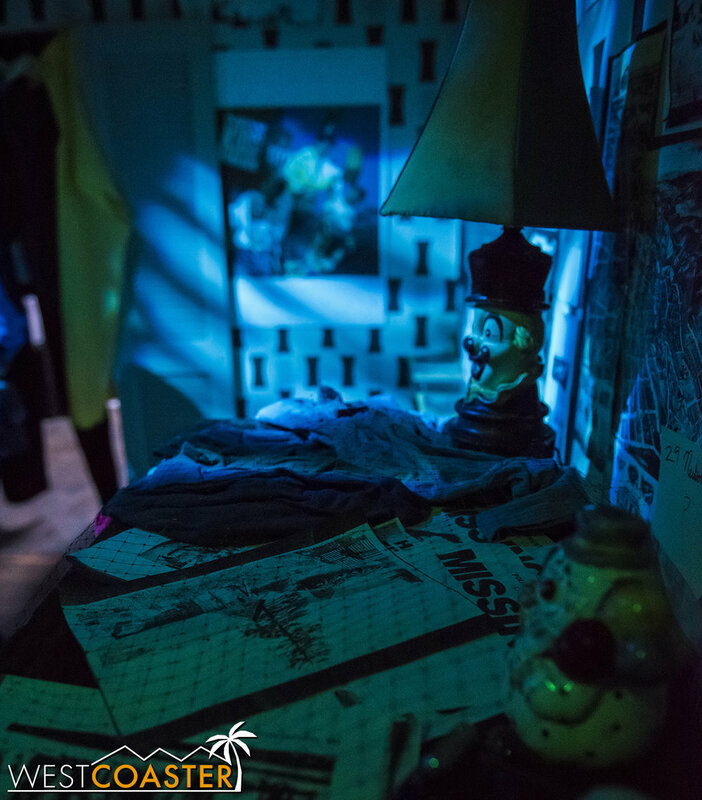 Horror Made Here featured a Conjuring maze last year, and of all the mazes, this is the most devoted to maintaining the story, because it makes guests active participants within the plot. 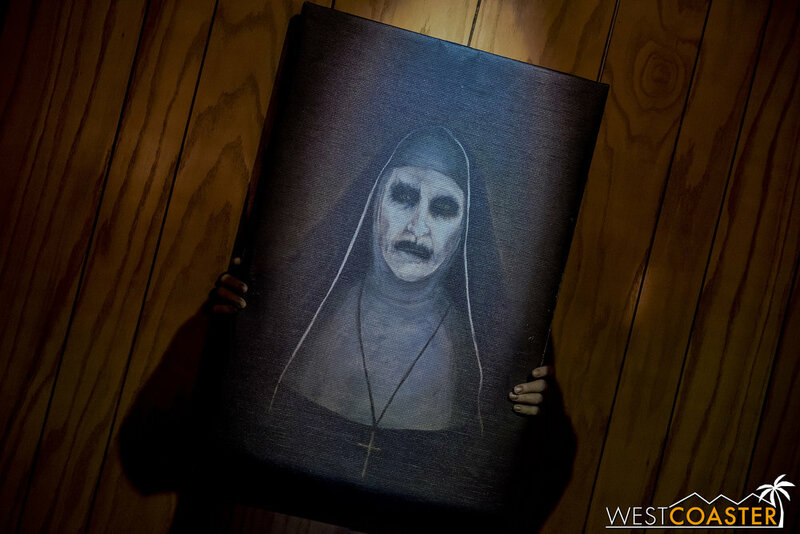 The premise involves touring the museum house of demonologists, Ed and Lorraine Warren, recurring characters from The Conjuring series. 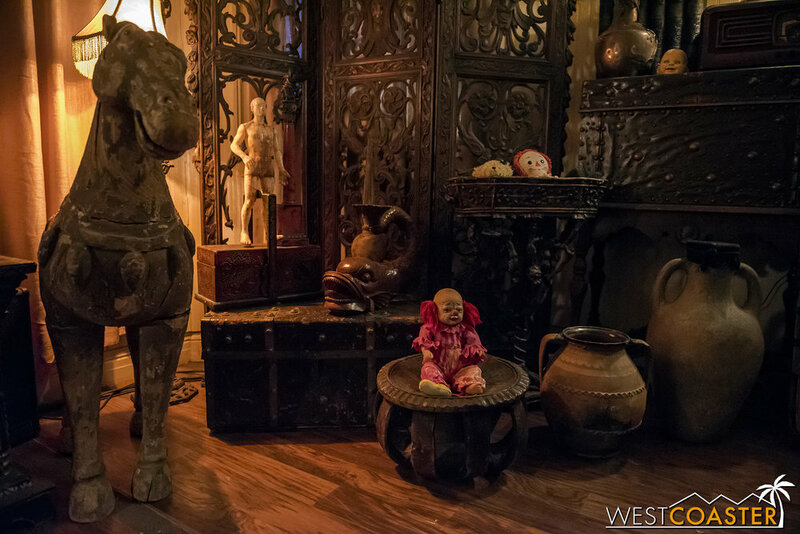 Despite reservations from some of the staff, the house has been open up for visits from curious tourists, who can see the many artifacts the Warrens have collected from their various ghostly case hunting. Creepy babies? Anyone calling for creepy babies? This maid is here to serve… you up to the demons. Unsurprisingly, there is more than meets the eye, and the house turns out to be a very strong magnet for the supernatural. Furthermore, said supernaturals quickly start causing trouble, resulting in a certain sense of hell breaking loose, and guests trying to escape the chaos and terror. The scenic treatment of The Conjuring Universe ranges from elaborate to simple, but is always at least a little bit chilling. I really enjoyed the scares in this maze. Most of them rely on practical effects more than jump scares from actors (though those are also present), but they very convincingly convey the feeling of being trapped in a house with many angry and active spirits. And the climactic finale features a particular scare that pulls off such a convincing illusion that guests are stunned, then terrified. Throughout it all, an intensely creepy ambiance pervades the entire maze. 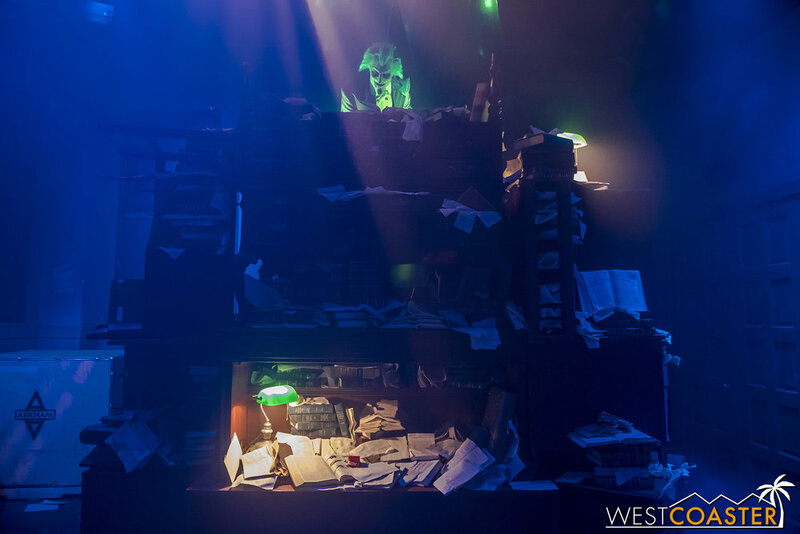 Simple theatrical lighting and soundscape focuses the senses and tension on the supernatural forces themselves. Just as the movies are done, this sparse approach to sensory stimulation in the maze directs the reception to the actual scares, and the execution is quite effective! Only by the narrowest of margins did The Conjuring Universe end up our second favorite maze instead of #1. And on a different night, it may very well be the best maze at the event. The downside: the nature of how groups progress in a start-and-stop fashion means that this maze had the longest waits throughout media night. It might be beneficial to hit this up early, unless one has a front of line pass. 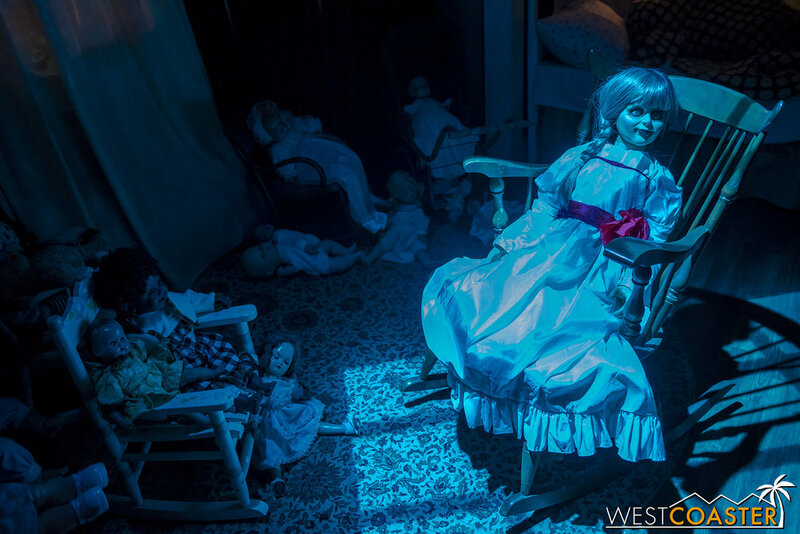 Naturally, guests encounter the wickedly terrifying Annabelle doll. Warner Bros.’ answer to Universal Studios’ Terror Tram involves Freddy and Jason this year. And while some might groan at utilizing an IP that Universal has already pillaged (multiple times! ), the actual attraction proved to be more enjoyable and engaging than we expected! This backlot tram attraction plays off a duality in which the driver acknowledges the governance of the real world as she points out various famous sets and areas of the backlot where famous scenes were filmed, then drops guests off at the wooded area and into a world where Freddy Krueger and Jason truly exist and are out to slaughter anyone in their path. 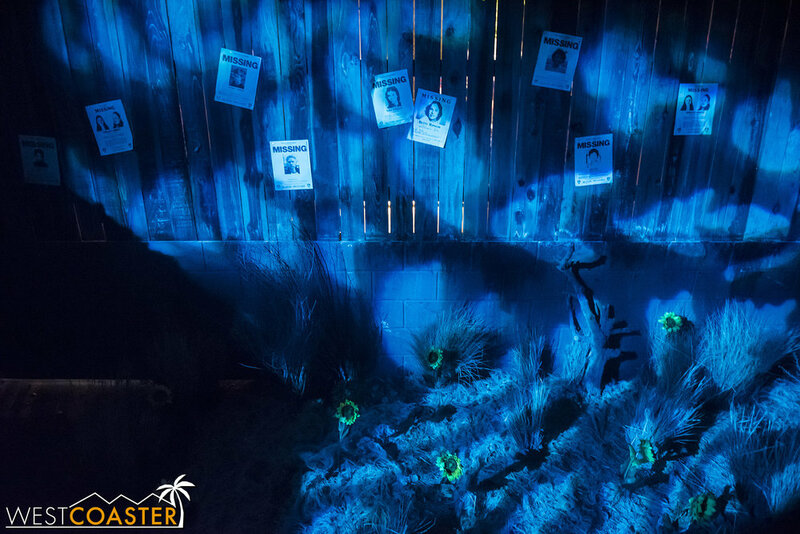 Guests must walk through the ensuing wilderness layout after being dropped off, but this allows them to actually be within the scene of a moment the maze is adapting, rather than simply passing by them. Note to self: don’t go out at night at Camp Crystal Lake. 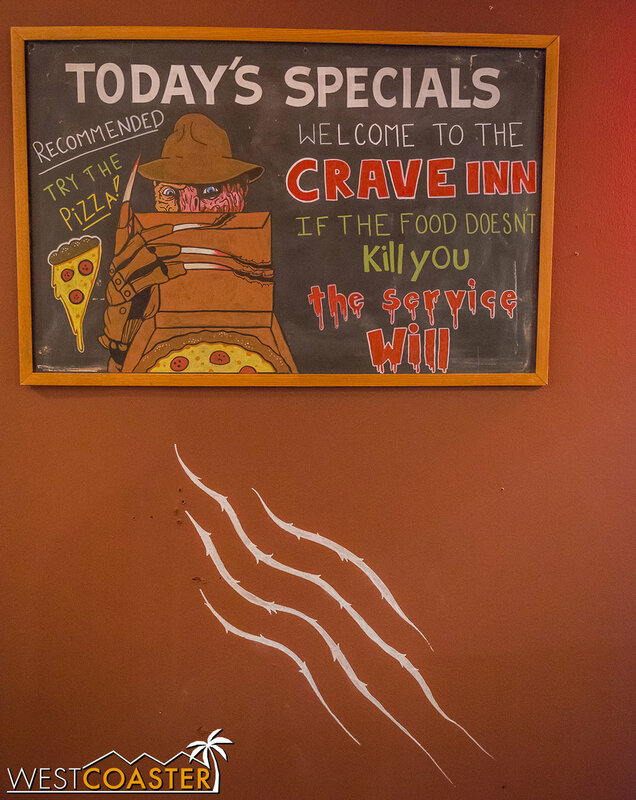 Jason likes to hang out and be slice-y. 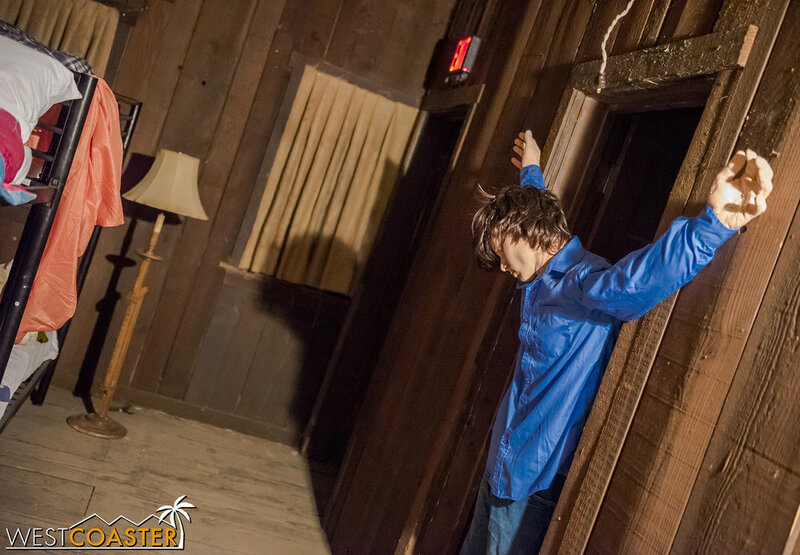 The actors of the attraction similar play effective roles in immersing guests into this alternate reality of horror. 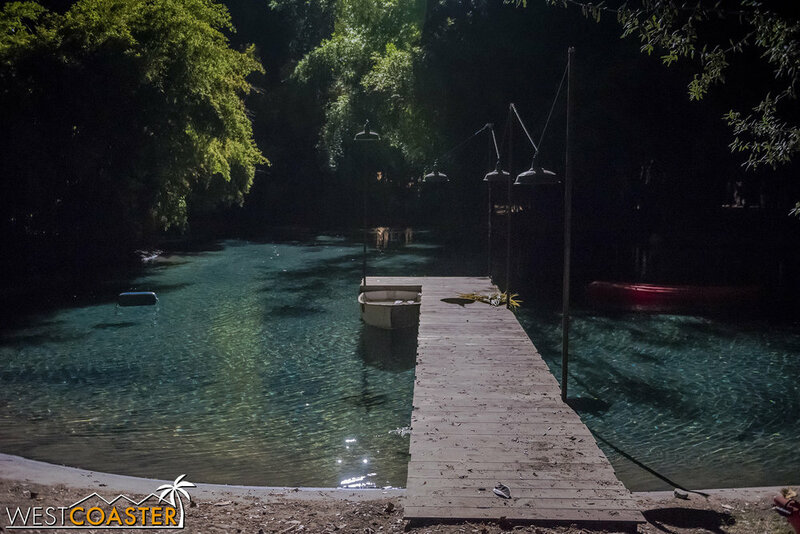 One of the first scenes guests witness as they enter Camp Crystal Lake is a panicked camp counselor warning people to get out of here, as a killer is on the loose. That triggers Jason to enter the frame and promptly catch and impale the counselor with his iconic machete. Then, he turns his attention onto the guests! For the rest of the trail, Jason and Freddy make recurring appearances at certain points. 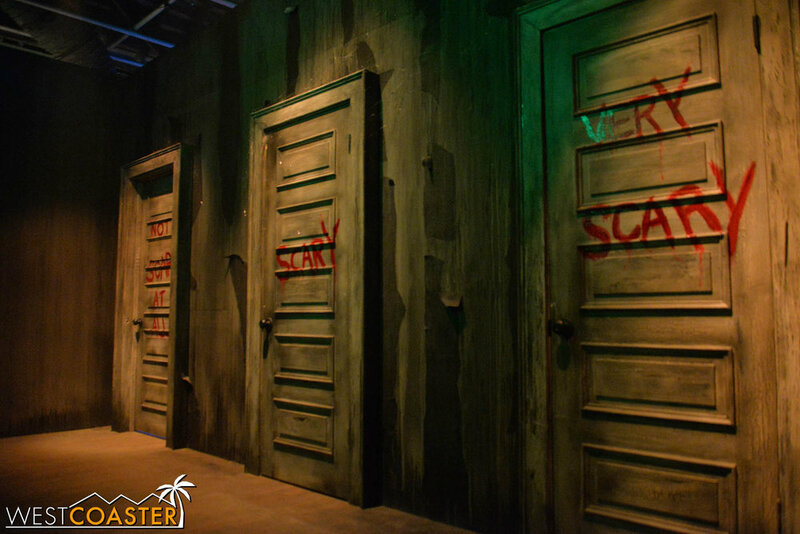 At one segment of the maze, guests enter an actual Crystal Lake camp lodge building, putting them literally into a set, since they have to navigate the pathway and escape the killer clutches of the iconic villain duo. This refreshing tactic really increases the feeling of being a part of a movie. Rather than watching the movie play out, they have a character role within it, and that ramps up the investment in making it through the experience in one piece! 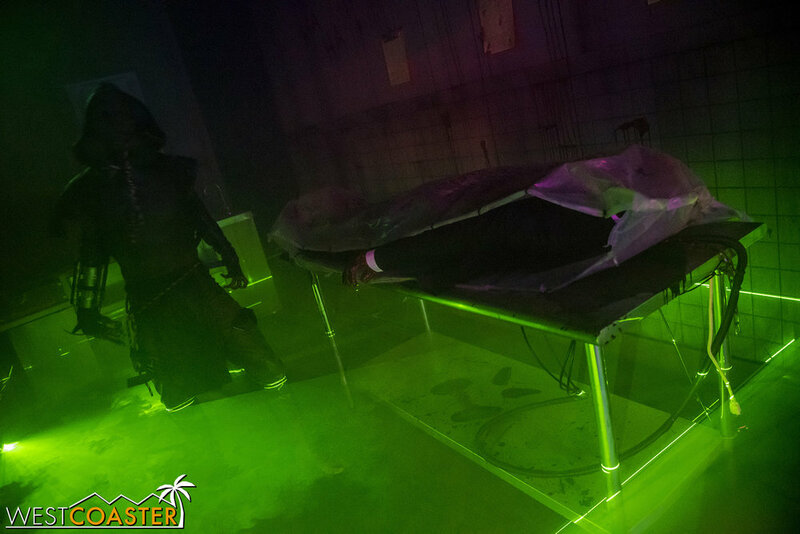 The Nightmare on Camp Crystal Lake maze often puts guests into the middle of the sets and scenes, rather then simply pass by them. If I could note one criticism, it would be a wish list to light some of the scenes with a little more sophisticated theater lighting. 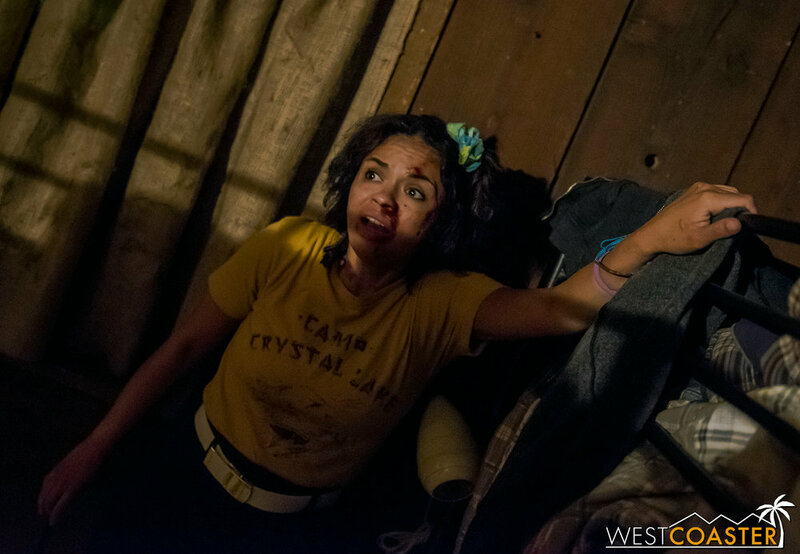 Every scene in the Nightmare on Camp Crystal relies on a single light source—typically a very bright bulb. And while this simplicity is effective in some scenes—mostly those where the use of singular light sources would be more accurate, it does detract from the photogenic qualities of some of the scenes. 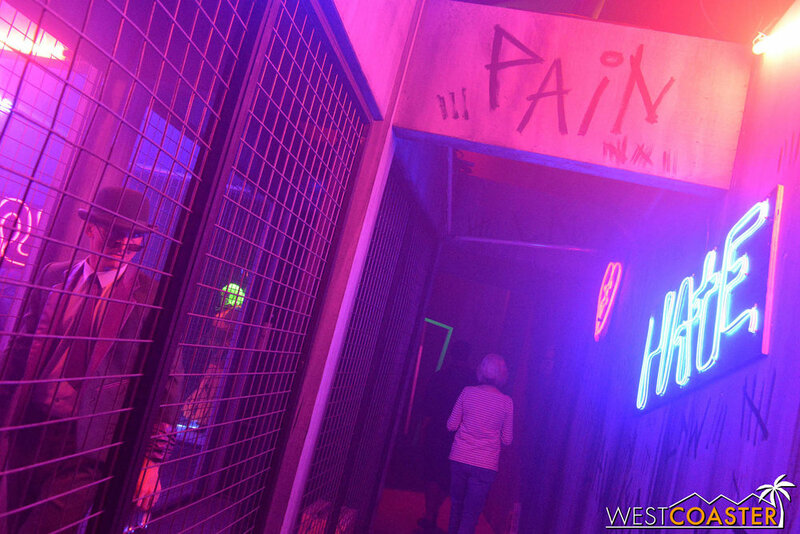 More even, directed, or even colorful lighting could have improved the polish of this part of Horror Made Here—particularly when the other attractions had that sort of quality sheen—and more! Although advertised as a haunted attraction, this is not any sort of walk-through experience. Instead, it’s effectively a ten minute 4D movie featuring “the scariest” scenes from William Friedkin’s horror classic. That may seem a little hokey, but we were pleasantly surprised at how enjoyable The Exorcist: Forbidden Screening ended up being! 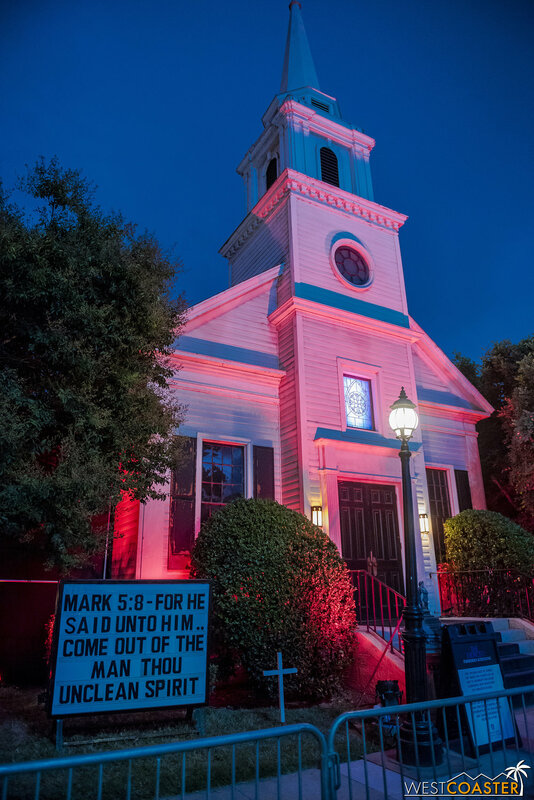 The church makes a fitting setting for this Exorcist attraction. This attraction has the expected light water spray, air jets, and pokes coming from the seats. There’s no surprise to encounter these effects in pretty much any amusement park 4D attraction these days. But Horror Made Here’s Exorcist attraction also features the use of rigged theatrical effects, practical special effects, and live actors at certain moments. It brings forth a convincing implication that the damned evil from the movie was somehow infesting the actual church space from which the screening is occurring, bringing new terror to the guests. A nun to greet people. The overall experience is about ten minutes worth of entertainment, through that also means the line only moves once every ten minutes, and the waits can become lengthy for those without the Losers’ Club front of line pass. Keep that in mind if deciding what to prioritize. Though we did enjoy this offering, I think that it was comparatively the least gratifying of the five main haunted attractions. If time is of the essence, I would skip this in favor of the other four. But if time does permit, do go ahead and try The Exorcist: Forbidden Screening! The stained glass becomes the cinema screen once the attraction begins. 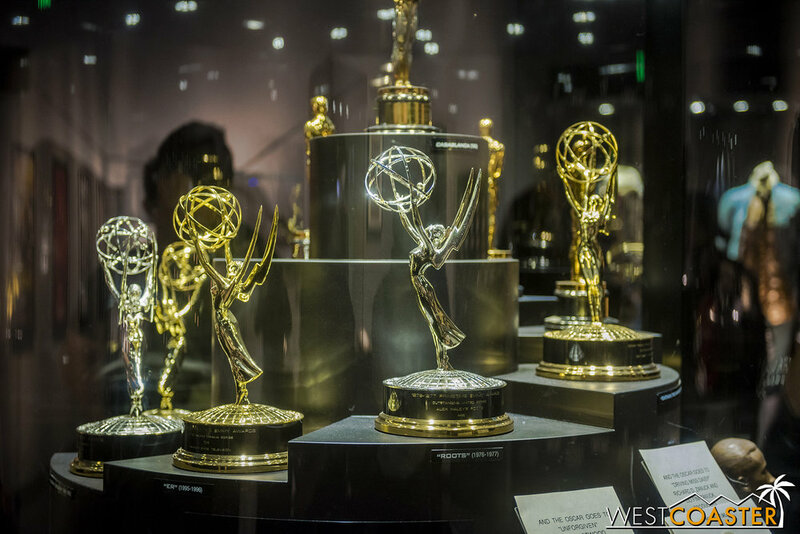 Stage 48 is a regular part of Warner Bros.’ daytime studio tour, providing a museum-style walk-through of the movie and television show making process. 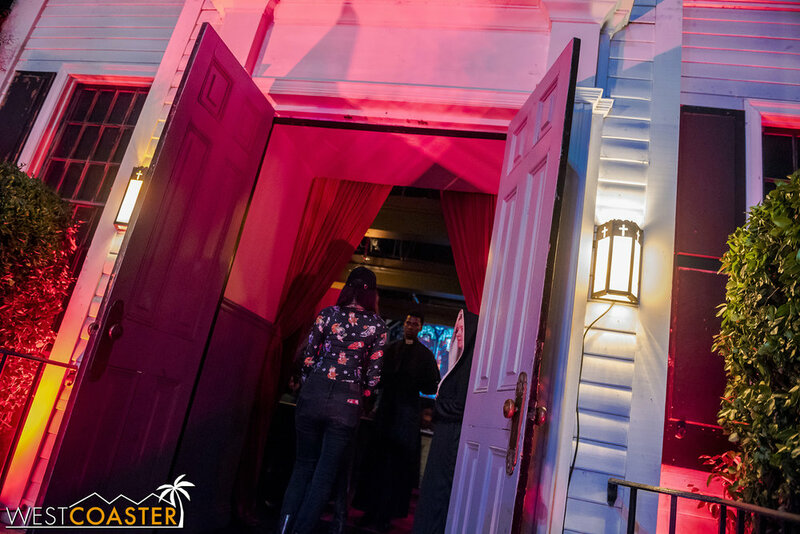 For Horror Made Here this year, Stage 48 has added props and exhibits from several famous Halloween or horror-related films and franchises, offering behind-the-scenes look at the creative endeavor that went into these productions. 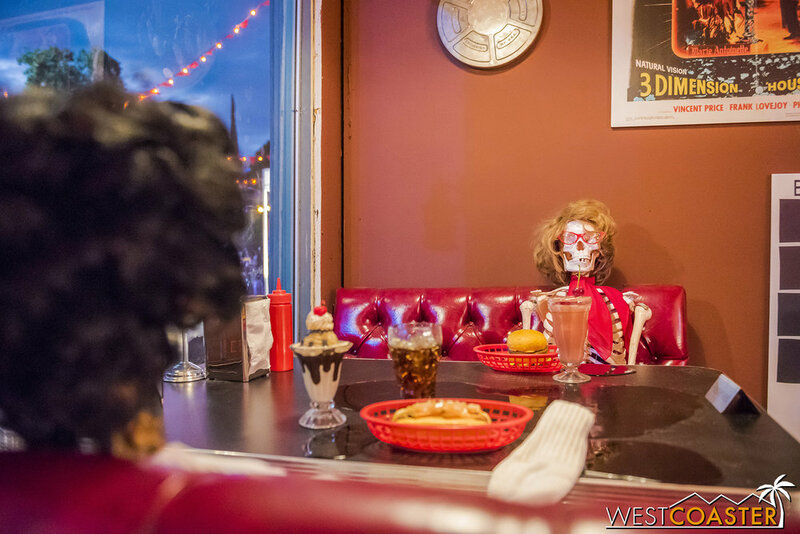 It is dedicated to Tim Burton—he of morbid movie directing fame—and features items from The Corpse Bride, Sweeney Todd, Mars Attacks, Beetlejuice, and others. 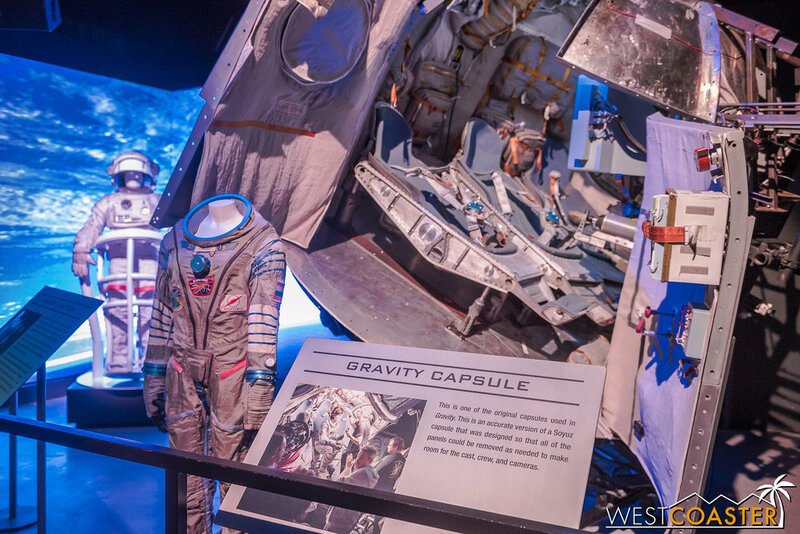 The rest of Stage 48 follows the regular daytime progression, allowing guests to learn more about the movie making process, sit on the set of Friends, and even playing with some green screen or motion capture magic. 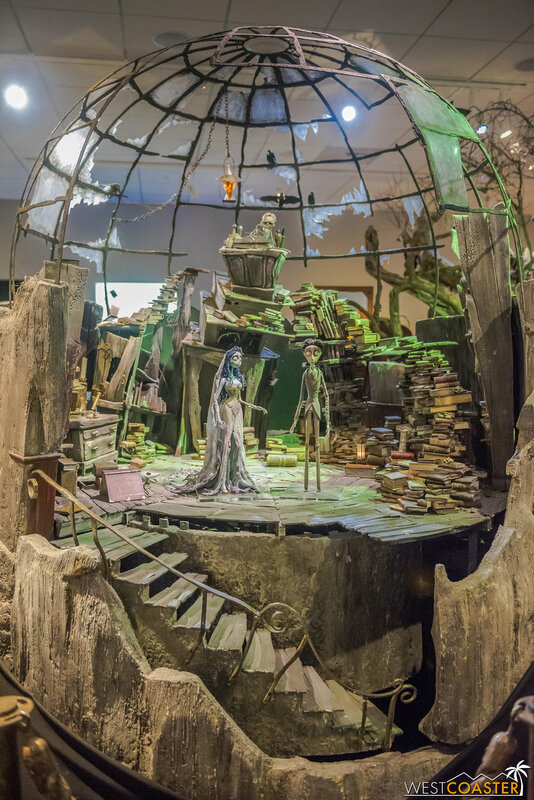 A beautiful miniature model from Tim Burton’s The Corpse Bride. The slitting color of Sweeney Todd. And some fun from Beetlejuice. 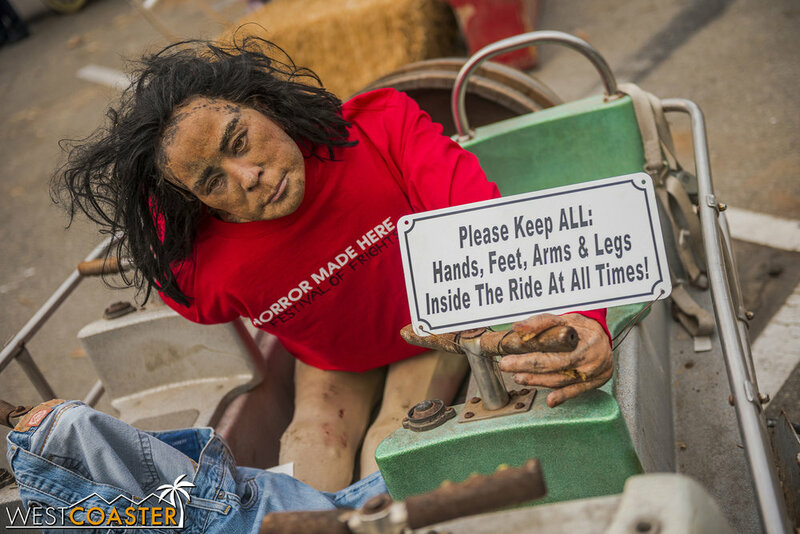 In addition to everything above, there are a few other listed attractions at Horror Made Here. The Fantasia Bar, modeled after the same-named drinking hole in True Blood, offers drinks and cocktails for the potable-favoring haunt guest. 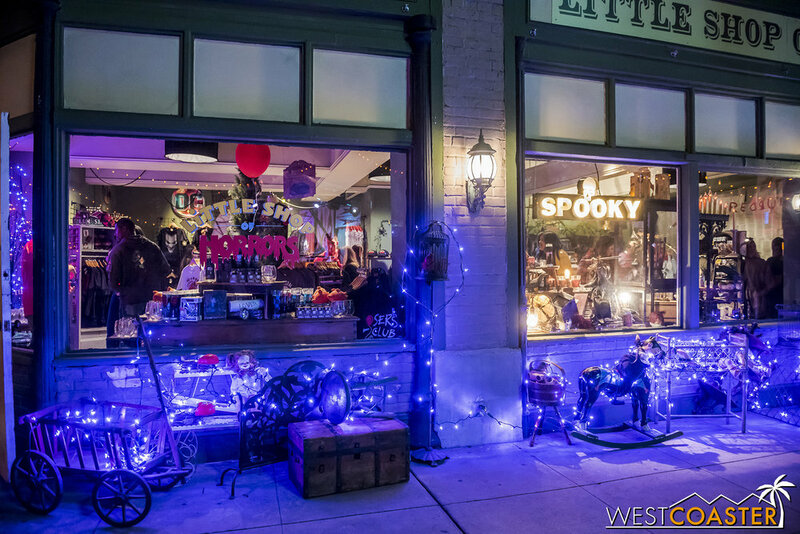 Across the way, Little Shop of Horrors features a variety of wonderful Halloween and horror movie souvenirs. Down the end of the lane, a Make-Up Demo takes place three times a night. There are additional attractions for guest amusement. 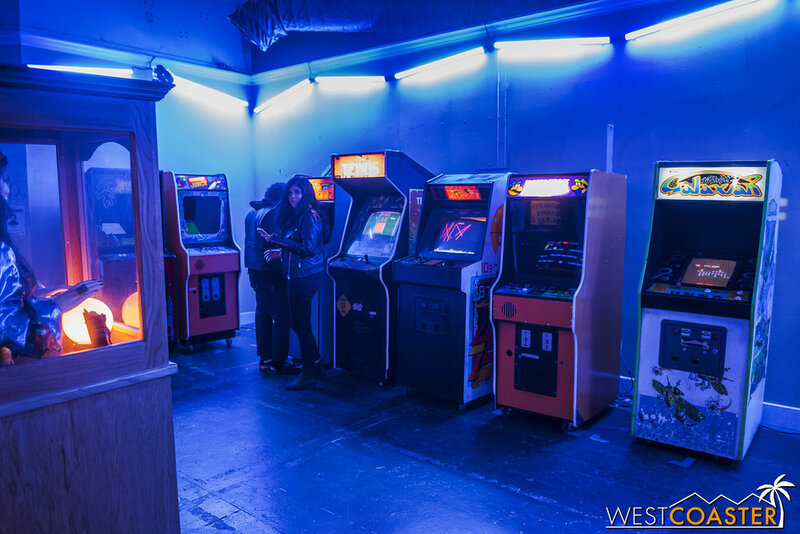 Lost Boys Arcade is literally an arcade with a half dozen classic video game machines. And Devil’s Drop located in the dead center of Stars Hollow, lifts guests high into the air before plummeting them back to Burbank ground. 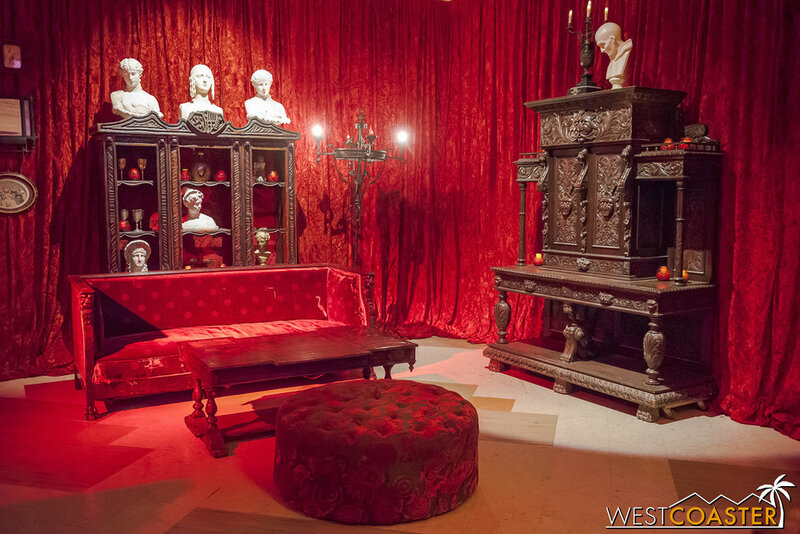 Fangatsia is themed to the famous True Blood bar. Devil’s Drop is the lone amusement park attraction at Horror Made Here, added for some variety and thrills. Guests should make sure to stop by the Little Shop of Horrors for some great souvenirs. Though the event is still small now--doable in half an evening if one is focused and targeted (or has a front of the line "Loser's Club" pass)--we see a lot of potential for Horror Made Here to grow and even challenge the heavy hitter almost literally down the street. 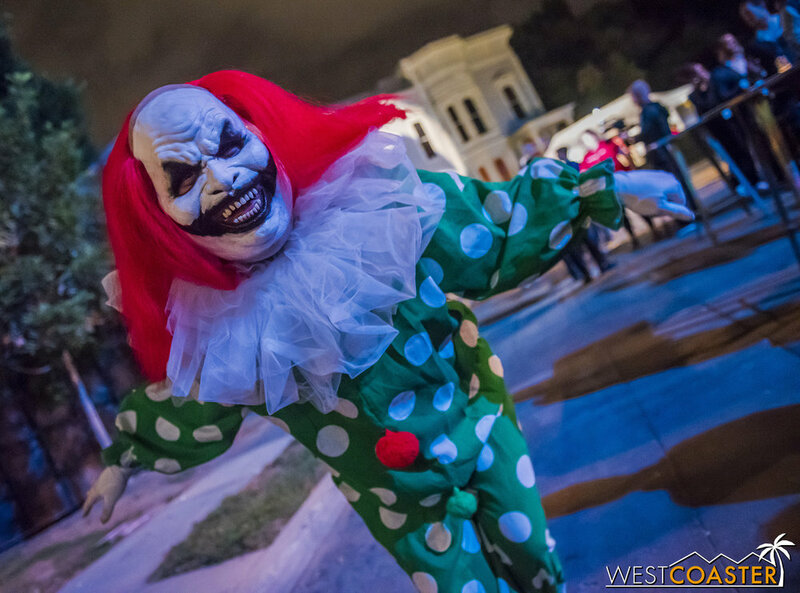 The attractions are very well executed, the talent highly energetic and deep in character, and the general atmosphere festive and spooky. The intimacy that event producers promised has definitely been delivered. I wonder what may happen with crowds as the event does grow and possibly sacrifices that intimacy either in response to increased public demand or a desire for increased profitability. On the preview Wednesday, lines to get in stretched down the backlot lanes and out toward public streets. 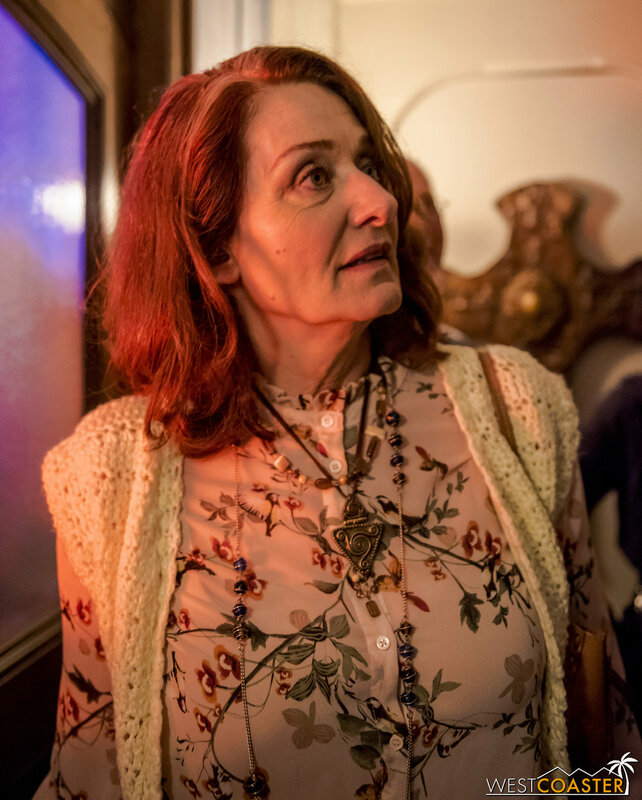 But inside, waits seemed to be somewhat manageable—It Knows What Scares You having the shorest average lines at around 20-30 minutes, while The Conjuring Universe took up in excess of one hour. Those are great times, but at least they’re not the two to three hours of Horror Nights. I would also say that just a little more quantity of live actors would help some of the mazes avoid being cast in the expectation of having triggered effects and scares only. At the end of the day, I value the scare the most, and nothing beats the perfectly timed, fine-tuned scareactor who knows exactly when to deliver the right startle. The biggest and only serious complaint I can make about the event is the pricing. Starting at $59 but ranging all the way up to $89 for peak nights is very steep, given the quantity of attractions offered. And the Losers Club VIP is $169 per person—though it does offer a good amount of amenities. Granted, the quality at this event is very high, but just compare the attractions-per-dollar cost of this versus a comparable tier event like Horror Nights (which itself can be pretty expensive), and Horror Nights beats Horror Made Here by two-fold in value. To put it another way, for the cost of one person to go to Warner Bros. on its busiest night, he could go to Knott’s Scary Farm for an entire season. I would say that the value would be more appropriate if ticket prices were $10-$20 lower than currently listed. The cost to Horror Made Here is a steep one per head, but the event is excellent, and worth checking out for horror fans. With the exception of the cost to attend, though, these are trifling critiques simply to search for a way the event can be better. 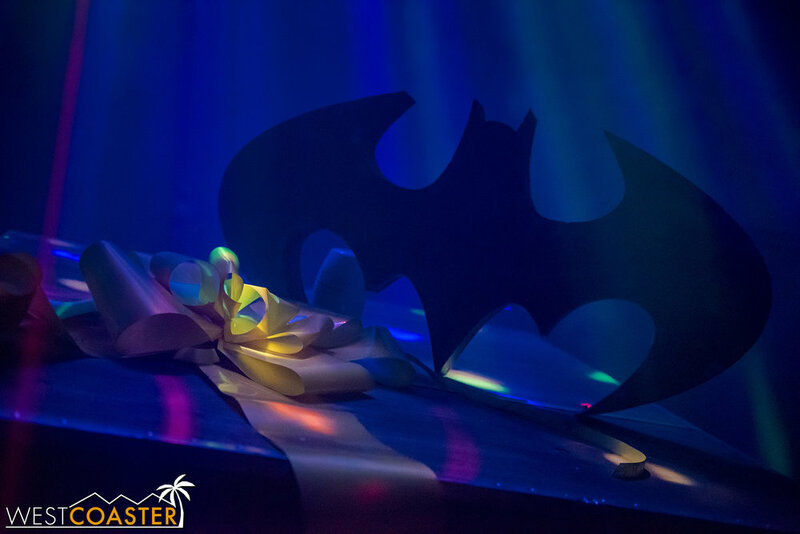 Overall, Warner Bros. has produced a winning event that I really hope succeeds. You can never have enough haunts, I say. And Warner Bros has made a fangtastic one here! Horror Made Here runs select nights through Sunday, October 28. Visit their web site online for more information and to purchase tickets.